United Nations Office for the Coordination of Humanitarian Affairs (OCHA) said on Wednesday that the situation in Jaghori and Malistan in Ghazni province is “chaotic” and that thousands of families are fleeing the area due to ongoing clashes. In a news brief on the situation in the two provinces, OCHA said that heavy fighting broke out between the Taliban, supported by some local Pashtun communities, against pro-government Hazara militias in Khas Uruzgan district in Uruzgan province in early November. OCHA said the tension was initially centered on the villages of Hussaini, Karez and Kondala, but that then the fighting spread to the districts of Jaghori and Malistan in neighboring Ghazni province. Clashes have escalated since Saturday, November 10, after reinforcement troops and air support were sent in. OCHA reports that the affected districts are chaotic and that families have been moving repeatedly in search of safety. The organization reports that displaced people are fleeing to Bamiyan and Maidan Wardak provinces and to Kabul. According to their report, civilian casualty numbers cannot yet be determined accurately but local sources have told them at least 15 civilians were killed in Malistan alone on Sunday, November 11. The organization also said reports have been received of violations of the International Humanitarian Law, with private houses burnt and civilian vehicles stolen or confiscated. “Families abandoning their homes are exposed to harsh winter conditions and in need of shelter and warmth,” they said. 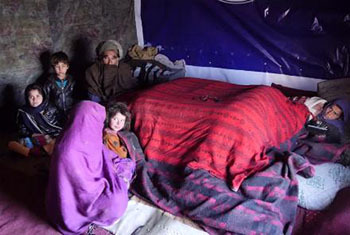 In Ghazni City, Afghanistan National Disaster Management Authority and the department of refugees and returnees registered 1,000 internally displaced families on 11 and 12 November. The IDPs are living in schools, mosques and homes of local families, OCHA reported. In Bamiyan Center, officials report that 400 displaced families have arrived but that there are reportedly up to 4,000 families headed towards Ghazni City and Kabul. OCHA states however that no humanitarian response has been carried out in Jaghori and Malistan as partner organizations have not been able to access the affected population due to the fighting. They also stated that in Ghazni city, provincial disaster management officials met on Monday and together with NGOs are now leading efforts to assess the situation and identify the needs of the displaced people. In Bamiyan, organizations have already started to provide non-food items, including warm clothing, to displaced families. On November 4, the Presidential Palace (ARG) said a team had been appointed to visit and review the Uruzgan problem – a week after clashes broke out in Khas Uruzgan. Since then however, conflicting reports have continued to emerge about who is involved in the fighting. 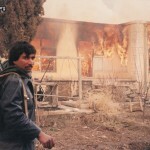 At the time local media published documents in which the Presidential Palace stated the clashes were being carried out between ethnic groups. But at the same time, the interior ministry said Uruzgan clashes were Taliban related and had been brought under control. But then already MPs from Uruzgan said the clashes were not ethnic related. “Taliban somehow have control over Khas Uruzgan and some other districts and for a few years they have been trying to create chaos in those areas,” Ali Alizada, an MP said. A Meshrano Jirga (Upper House of Parliament) member Amanullah Azimi meanwhile warned at the time of a possible ethnic-related problem arising. “I am afraid that a problem may be on the rise there between the Hazara and Pashtuns,” Azimi said. Prior to this Second Vice President Sarwar Danish had criticized security departments for not doing anything about the clashes in Khas Uruzgan district. Danish in turn asked the people to stand up against the insurgents and defend their lives and areas. This past weekend, things took a turn for the worse as heavy clashes broke out in Malistan and Jaghori. The ongoing situation also led to Monday’s mass demonstration in Kabul city which saw hundreds of residents march to the Presidential Palace in protest against the crisis. Protesters only called off their demonstration once Ghani gave assurances that troops and air support would be sent in to tackle the problem. High ranking security officials, including the Army Chief of Staff Sharif Yaftali also deployed to the area to help launch an operation to resolve the issue. Meanwhile the ministries of defense and interior said on Wednesday that the threat level continues to remain very high in these areas but rejected claims that the conflict could be ethnic related.